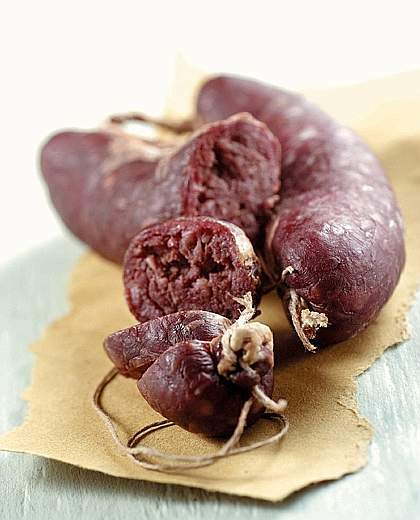 The boudin (or also boudeun) are among the great classics of Valle d'Aosta and are still prepared in strict accordance with ancient recipes handed down through generations. This is a very particular sausage because it is made whit boiled potatoes pealed by hand to which are added bacon cubes, beetroot (an excellent natural preservative), natural flavour and spices and, above all, the ingredient that causes the red color, that is the pork or beef blood. The mixture is then wrapped and hung to dry for a couple of weeks. Once considered a poor food, today is a characteristic food of the aostan tables. Excellent as a cold starter, can be also served boiled combined with red mountain potatoes or alternatively baked for about fifteen minutes when it is still fresh, and it becomes a true delight for the most discerning palates. It must be served with young local red wines with good aromatic reach. During the month of June takes place the "Mangia a pià": it is a culinary walk in the town of Chatillon and there are seven stages and many dishes have as protagonist the typical Valle d'Aosta boudin sausage. Reservation are recommended as there are 700 seats available. So if you want to come to visit this event, just book your trip using the site Leibtour.com. A curiosity: if you do not like the pork blood idea, you can also taste the "bloodless" version, that stands up for its unique pink color due to the beets.